The following is a guest post from David R. Hussey, a 4th year History major at the University of Waterloo. He previously wrote about timelines in Zelda. Social media has changed the way that the world receives the news. This revolutionary change is huge for my generation. In 2011, the Pew Research Center published that the Internet was now the main source for the news for people under the age of 30 in the United States. This is drastically different from twenty years ago, when the news was undergoing another drastic transformation. Today, getting the news from across the world instantaneously is the norm. Before the 80s though, this was not the case. Hearing news from the front line had always been delayed but this all changed with the Gulf War. On January 16th 1991, the United States began bombing strategic targets in Iraq and Kuwait in response to the former’s invasion of the latter. The UN sanctioned and US led Coalition’s involvement lasted just under two months and with few casualties but the war overall showed some changing trends in the world. For the first time in history, American people were able to watch how the war was unfolding live on TV. 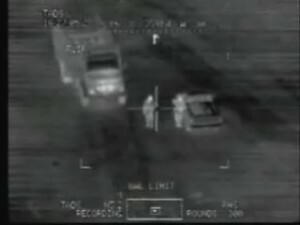 Satellites and mounted cameras on military vehicles allowed news networks to get video from the front lines and put it into American homes at a fraction of the time it took before. This new approach by the media influenced how people saw and received the war. The newly available footage from military equipment became a mainstay on news networks during the Gulf War. This constant footage so closely resembled the heads-up display of a video game that the conflict earned the nickname, the Video Game War. Ironically though, very few developers have ever made games about the Gulf War even twenty years later. philly.com writer Joe Logan wrote about this after the start of the war in 1991. He interviewed different video game company executives and asked their position on a making a Gulf War video game. The executives he interviewed claimed that they wished to take the moral high ground by not making the games. They said that making a game so soon after the war would be disrespectful to the veterans. However, this sentiment didn’t extend to all developers, namely Electronic Arts. 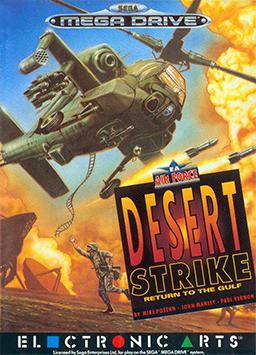 In February 1992, a little over a year after the end of Operation Desert Storm, Desert Strike: Return to the Gulf was released for Sega’s Mega Drive system. The game puts the player in control of an Apache helicopter that runs missions during a conflict between madman dictator General Kilbaba and the United States after he forcefully gains control of its small neighboring emirate. There are obvious parallels between the game’s story and the Gulf War. If EA was trying to be discreet by using a fake storyline, they weren’t successful. The game sparked controversy upon its release and the magazine Commodore User (CU) reported that some veterans burned copies of the game in protest. For historians, the game provides insight to the public sentiment and mindset during the war. Desert Strike constructed its gameplay based on the media coverage of the war rather than the actual battle plans. By not making the game directly about the Gulf War, the developers freed themselves from the constraints of history and were able to focus the game on what the public saw during the war. 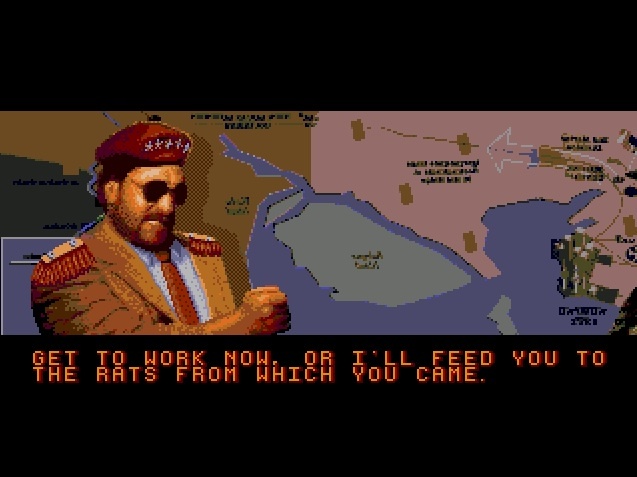 The game’s villain shows the qualities that the American public believed that Saddam had, focusing on the most evil of his attributes. 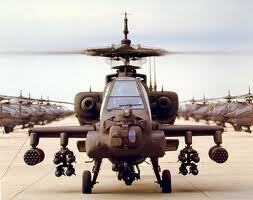 As well, the use of Apache helicopters was influenced by their usage and media popularity during the war. SCUD missiles also were a popular media topic during the war and so became an important part of Desert Strike. Lastly, chemical and nuclear weapons play large roles in the game because they were so widely covered during the war. Desert Strike’s gameplay and storyline are influenced by the media coverage of the Gulf War. Saddam Hussein’s Desert Strike counterpart, General Kilbaba, is a tyrannical ‘madman’ who is not afraid to use torture and weapons of mass destruction in his attempts to cause a global conflict. General Kilbaba exhibits all of America’s greatest fears of Saddam Hussein. His persona is taken to the extreme with an emphasis on his cruelty and eagerness to use torture. This exaggeration is for gameplay and story purposes but also displays how the American people viewed Saddam Hussein. Articles found on the New York Times website published before the war give some insight as to how Saddam Hussein was viewed before the January 1991. Authors called Saddam a ‘megalomaniac’ with a history of human rights violations who could have access to nuclear weapons along with chemical and nerve gas who was bent on shifting the geopolitical landscape by controlling the majority of the Middle East’s oil. These were all things that EA included when creating Kilbaba’s character. The game manual explains that Kilbaba is trying to start a global Armageddon and is gaining the military capabilities to do so. Next, the introductory cut scene shows Kilbaba torturing men before threatening to kill his Deputy if he is not obedient. Finally, in the second campaign, one of the player’s objectives is to destroy a chemical weapons lab. While it’s true that Saddam was a malicious ruler, his threat to the world was minimal. Jean Baudrillard argued in his essay The Gulf War Will Not Take Place that “Saddam Hussein is worthy of neither challenge nor annihilation” but the media attempted to raise him up as a worthy foe of democracy. While this may be an extreme view, it’s fair to say that the media pumped up Saddam Hussein as a much greater villain than he was in reality. Kilbaba is a representation of the American understanding of Saddam Hussein in 1991. The military technology that became prominent in the Gulf War was featured in Desert Strike. The United States involvement in the Gulf War was primarily in air combat missions. 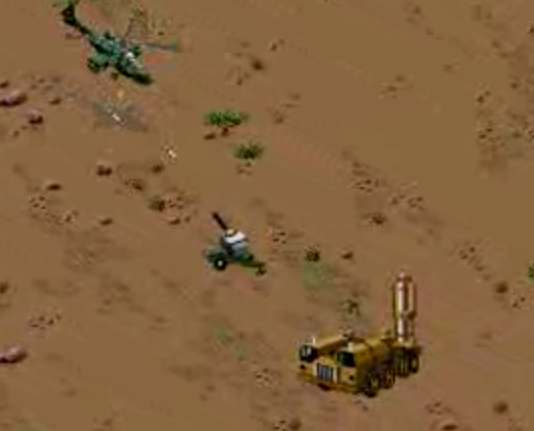 So, in Desert Strike, the player controls an AH-64 Apache Attack Helicopter. While the Apache helicopter first saw combat in the 1989 invasion of Panama, its debutante was in the Gulf War. They became so lethal and feared that Iraqi troops began referring to them as “the Black Death.” According to some analysts, the Apache helicopter was one of the most valuable, if not the most valuable, military weapons of the war. As well, lots of video taken from Apache helicopters was given to the media, so the public was able to see the destructive capabilities of these aircraft first hand. 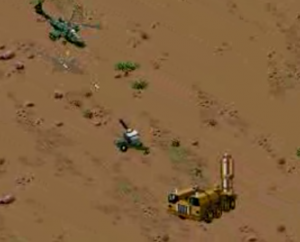 It’s no surprise that Desert Strike chose to use them as the player controlled vehicle in the game. SCUD missiles are an important aspect of Desert Strike’s gameplay because of their coverage during the war. The second campaign in Desert Strike is called SCUD Buster and the objectives are focused on stopping Kilbaba’s troops from firing SCUD missiles. SCUDs are Soviet designed ballistic missiles, which Iraq fired on Israel and Saudi Arabia during the Gulf War. SCUD missile attacks caused large explosions but generally didn’t cause large numbers of casualties. Phillip Taylor argues in War and the Media: Propaganda and Persuasion in the Gulf War that the media extensively covered SCUD attacks because reporters were looking for first-hand material rather than second-hand military supplied footage. He says that the media, “over-[indulged] in the SCUD-Patriot [Missile] duels which were in reality but a small facet of the overall conflict.” The media created the obsession with SCUD missiles. It was not an obsession that originated from the military commanders. It is clear that EA made SCUDs an important part of the gameplay because of the media coverage of the war. The chemical and potential nuclear arsenal of Iraq became an important talking point before and during the war. Iraq had used chemical weapons extensively during the Iran-Iraq War, with some estimates of as many as 100,000 civilian and military casualties from these weapons. This became very important to news media in the months leading up to and during the war. 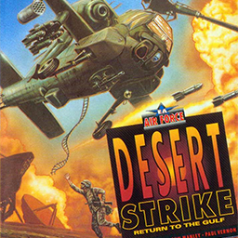 In Desert Strike, the second and third campaigns include objectives where the player must destroy chemical and biological weapons plants and factories, which were also missions for the air force during Operation Desert Storm. As for nuclear weapons, there was no firm evidence that Iraq had nuclear weapons leading up to 1991, in fact, most analysts and experts were sure they did not have weapons. However, Iraq had been trying to make nuclear bombs for more than a decade before the invasion of Kuwait and some feared that Iraq could be close to succeeding with their research. 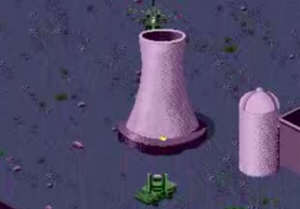 The final campaign of Desert Strike is called Nuclear Storm, and nearly all of the objectives have something to do with nuclear weapons including destroying bomb materials and a nuclear facility. In his second essay on the subject, The Gulf War: Is It Really Taking Place?, Jean Baudrillard argues the speculation that the Gulf War may have led to “annihilation, holocaust, and atomic apocalypse” the result of “media hysteria.” The media’s speculation was based on the assumption that the Gulf War might become a total war in the traditional sense, which it never truly did. The conflict more or less became a display of America’s military superiority over Iraq and not a war. So, while chemical and nuclear weapons production plants were important targets during the Gulf War, they played a much larger role in the video game representation. The public perception of Saddam’s weapons of mass destruction drastically influenced the gameplay of Desert Strike. The media plays an important role in every war. During the Second World War, the media encouraged men across America and Canada to donate to the war effort or enlist. During the Vietnam War, the media helped ignite the anti-war cause that became so significant in the 1960s and 70s. As for the Gulf War, the live coverage of the war dictated the topics that the public would discuss and remember from the war. Without the media coverage; SCUD missiles, Apache helicopters, Saddam Hussein and the nuclear and biological capabilities of Iraq may not have become household discussion topics. Without the media coverage Desert Strike would be a drastically different game, if it existed at all. The Gulf War’s media coverage was revolutionary in 1991. Never before had the public been able to receive up to the minute, if not up to the second, information on a conflict being fought thousands of miles away. It signified that starting now; wars could and would be covered in real-time. Our society takes for granted sometimes that we can get up-to-date information from the Internet at any time but, for 1991, this was a glimpse into what the future held. It was a glimpse into our instantaneous world. As it happens, I was thinking about this topic recently too. Full disclosure: I was a senior tester on two of the games specifically set in the Gulf War, Conflict Desert Storm 1 and 2 (before I was interested in history). These games also used media tropes about SCUD missiles, and a scan style briefing for the mission. They were also specifically set in the Gulf War not a fictional version, but instead focussed on a small group of fictional soldiers. It was influenced by the tone and kind of events in Andy McNab’s Bravo Two Zero, itself an interesting media phenomenon. Media discourse shaped the plots of these games too. Although real elements were included,the same fear of plutonium/Sarin formed the motivation for missions and the Supergun also appeared (http://www.nytimes.com/1990/08/26/magazine/the-man-behind-iraq-s-supergun.html?pagewanted=all&src=pm). Making these games still felt topical (they were released in 2002 and 2004) with ethics being relevant, as game technology had caught up to offer a ‘realistic’ feel. 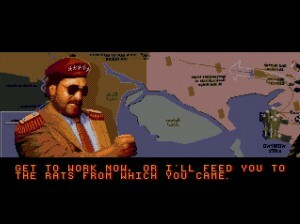 The subject of the war was treated in a rather less camp way than Desert Strike, reflecting the new found realism of the technology at the time.